For the sum-total of 13 days, Google's Nexus 5 has been without doubt the best value Android phone on offer. Today, Motorola -- famously part of Google -- has potentially stolen that title with the official reveal of the Motorola Moto G Android smartphone. A quick tour of the specifications -- the 4.5-inch/720p screen, Android 4.3, 1.2 GHz quad-core processor, 8GB of storage and a 5-megapixel camera -- might initially suggest it's no threat to the Nexus' universally superior artillery. Until you learn that the Moto G costs around $179/£135 SIM-free ($199/£159 if you'd prefer 16GB of storage). That's nearly half the price of the Nexus 5, and much lower than many other competing handsets out there right now. There are, as you can imagine, a couple of significant trade-offs to factor in. There's no mention of support for 4G/LTE, making HSPA+ your fastest data option. Which will be a deal-breaker for some, even with the low price considered (the similarly priced Lumia 625 manages to squeeze it in). It also isn't fully customizable like its elder, and US-only sibling, the Moto X. Though you can still make it your own with a range of changeable back covers. 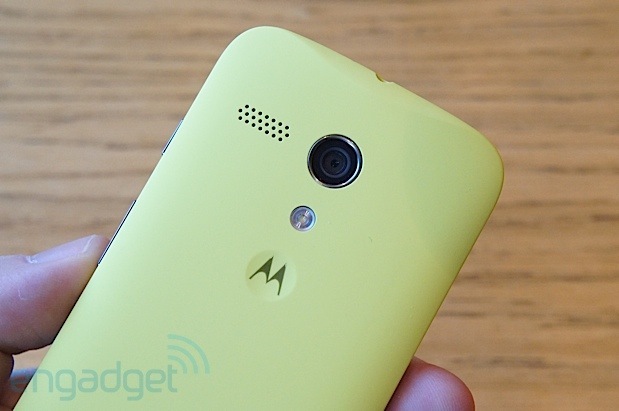 Lastly, it's already been confirmed that the Moto G will get Android 4.4 KitKat by January 2014. If you're still undecided, the finer details include a 1.3-megapixel front camera, 720p video shooting, Bluetooth 4.0 and a water-repellant coating. The Moto G will launch in Brazil the UK and Ireland today, Canada and other parts of Europe in the coming weeks and will come to the US and India in (very) early 2014. Head past the break to see exactly how much phone $179 buys you these days. Understandably, Motorola made a big deal about the price of the Moto G. Normally, we won't lie, this sets our expectations pretty low. However, within seconds of holding the Moto G for ourselves, we knew that this was off to a good start. The device feels solid, with a build quality similar to much more expensive handsets. In fact, as we held our more plasticky feeling Galaxy S4 in the other hand, we'd be tempted to say that the Moto G really does feel above its class. The back panel's matte finish gives it a grippy feeling, and there's very little over all flex in the body when we give it a good squeeze. The general shape and design is very similar to that of the Moto X (as you might imagine,) which also primes your brain for thinking of it in the same league. Customization was also a big deal with the Moto X. That's something else that the Moto G has inherited. The back cover can be snapped off and replaced with a range of other hues, such as the black, and yellow you can see in our gallery. There's no memory card slot hidden underneath, but there is a 65GB of Google Drive to bundled in to make up for it. Also the battery isn't removable, but Motorola did sing up how it's gone to lengths to make sure it easily lasts a day -- though only time will tell. As is the fashion these days, there are flip covers, too, if you'd prefer to keep that display safe from harm. Hopefully you won't need, as it's Gorilla Glass. Also, we have to say, it looks pretty bright, crisp and clear to us. It might "only" be 720p, but at 4.5-inches, that amounts to a pretty decent PPI of 329. Given that performance of the UI, and the display that shows it are two of the biggest factors in how it feels to the user in terms of performance, the Moto G really seems to be off to a good start. As for software and performance, the good news is everything looks pretty good. The version of Android is essentially pure JellyBean. Zero skinning, no default widgets, nothing. This is good news, and almost certainly adds to the pleasantly responsive UI. There are a few tweaks. Motorola has replaced the stock camera interface, with one of its own, and it's pretty minimal. In fact, there's almost nothing onscreen. Simply tap anywhere, and it'll take a snap, and if you want to change some settings, swipe out from the left. Swiping right takes you to the gallery. One other software addition, is something called Assist. It's effectively an app that learns how you use the phone, and changes various settings on your behalf -- think silent mode when you sleep, but with the options for it to still ring when it's mom calling. One thing absent that we really would have loved to trickle down are the Active Notifications and Touchless Control features. Considering this is Motorola's first international device since Google swallowed it, the Moto G is more about taking on the budget market. It's made an aggressive play that shows low-price doesn't have to mean low-spec. Typically cheaper lines, such as Nokia's Asha phones, or Samsung's vast collection of "other" Android phones offer value in direct relation to functional trade off. Motorola is showing that perhaps, you know, people who can't afford flagship might still want a seat at that table. It's hard to say how well it's actually delivered on this new take on price-conscious phones, but from the time we spent with it, we'd say they're off to a really good start.